The greening of industry is increasingly recognized as key to economic competitiveness and sustainable growth for both countries and businesses. For developing countries in particular, green industry can play a major role in poverty alleviation, the delivery of goods and services, job creation and improved standards of living, as well as increased productivity and improved access to premium markets. Recent modelling from the Global Green Growth Institute (GGGI) builds a strong economic and social case for greening the industrial sector in Cambodia. The study shows that the introduction of green technology in four key sectors can lead to an increase of USD 2.7 billion in real GDP by 2030, create 512,000 new jobs, and reduce greenhouse gas emissions by 3.37 million tons. It also demonstrates why resource efficient technology is an attractive business investment, with high and quick returns, major productivity increases, reduced production costs and higher profits. What policies help drive green industry? What sectors have the most to gain from greener industrial practices? How can governments administratively and politically manage the green industrial transition, while minimizing potential negative impacts on the economy and workers? What are national examples of successful green structural change? 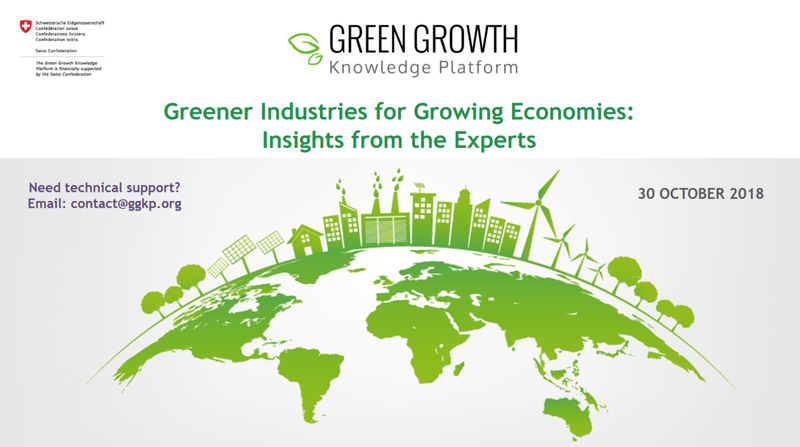 On 30 October (3:00 PM - 4:30 PM CET), the GGKP held a webinar to explore these questions with green industry experts. The webinar featured a new report showcasing the findings of GGGI's green investment modelling in Cambodia, Economic, Social and Environmental Impacts of Greening the Industrial Sector, as well the Green Industrial Policy: Concept, Policies, Country Experiences report and the Practitioner's Guide to Strategic Green Industrial Policy, which provide comprehensive guidance for greening industry.